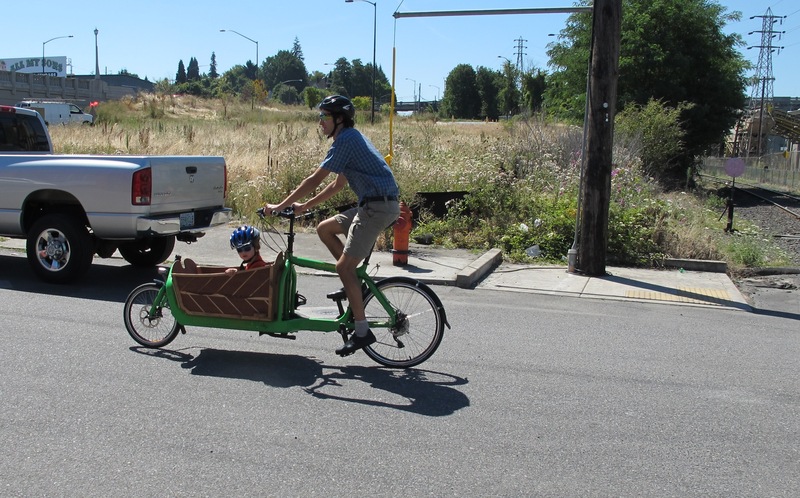 When we visited Portland two years ago, I had good intentions of visiting bike shops and test driving some cargo bikes, as I was already dreaming about adding something with serious kid- and cargo-carrying capacity to our fleet. Alas, somewhere in the mix of vacation with a 14-month-old, this just didn’t happen. Anyhow, when we were planning our return trip to Portland, just a few months after purchasing our own cargo bike, I prioritized trying something new-to-me. A bit of research revealed that for $25 we could rent a Bullitt bicycle (a bakfiets or Dutch long-john cargo bike that I’ve read about over at Tiny Helmets Big Bikes) for a day from Splendid Cycles. I emailed the shop owners, settled on a date, and that was that. 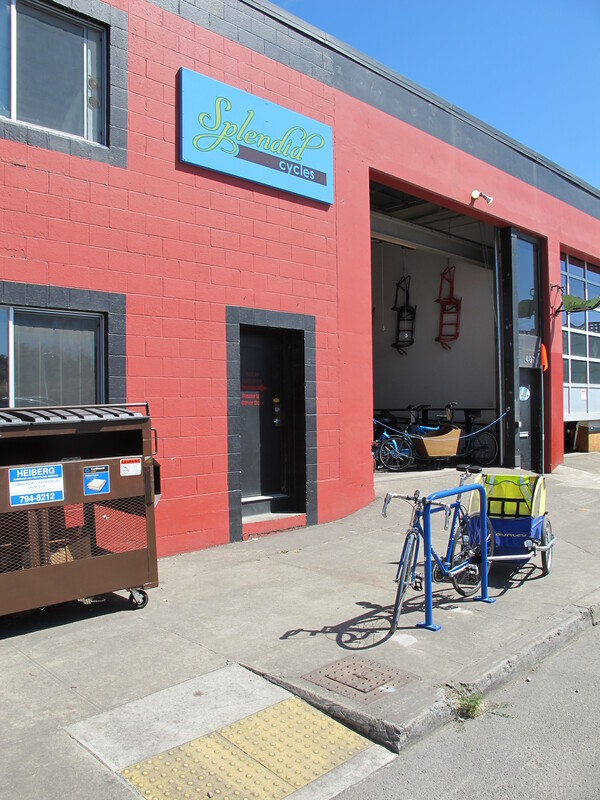 On Thursday morning, we blew right past Splendid Cycles and were partway down the Springwater Trail (along the Willamette River) before we realized we must have somehow missed the shop. We backtracked and found the shop right at the trail head. They put a lime green Bullitt up on the repair stand to look things over, while we browsed their other offerings and chatted with one of the owners. Can I sit in here? Gabriel’s a fan of this model with the sweet rain cover. Also love the detail work on the box! Gabriel checking out Big Blue’s (AKA Roadrunner) long-lost twin, with the Hooptie accessory (the wrap-around bar he’s holding onto). I’m totally wishing we included one of these when we ordered Big Blue. I imagine we’ll end up getting one, we’ll just have to eat the shipping cost. With the Hooptie, we could carry Gabriel and one or two of his friends, which could come in handy. I waited with our borrowed bike and trailer . . . .
Several minutes later, they returned, and Matthew announced he was good to go. With lunch and nap-time looming, we set out on our three-mile trip home, which was significantly uphill. I could tell the hills required a good bit of effort (more effort than I exerted pulling the trailer), but all-in-all, Matthew made it look easy. After lunch, we were all tired, so I didn’t get my shot at the Bullitt until after nap time (can’t believe I waited that long, after all the excitement). After naps all around, we loaded the bikes and set off for a short jaunt to a neighborhood farmer’s market. I hopped on the Bullitt, tried to turn the bike in the direction I wanted to ride, panicked, and dumped it in the middle of the [low-traffic, residential] street. By “dumped,” I just mean that the bottom edge of the box met the asphalt (at very low speeds). Gabriel was just fine, strapped into the padded seat in the box. I imagine this is not an uncommon first experience riding this style of bike, but it was an inauspicious start, and did not exactly make me confident about handling the bike in traffic. I picked it up, Matthew gave me a couple more tips and a pep talk, and we headed out. Once I got the bike up to speed, all was well — the stops and starts were the tricky part. Unfortunately, stops and starts are part and parcel of operating a vehicle in an urban environment. I quickly realized that my beloved “balance stop” was not an option [for me] on the Bullitt. I needed to plan on each and every stop sign being a “foot down” stop, or there was a good chance of tipping. Fortunately, many of the bike boulevards in Portland minimize stop signs, so the stopping situation was less annoying than it would have been in St. Louis. Matthew was astonished, because Gabriel is usually all-mommy, all-the-time. The next words out of Gabriel’s mouth were, “Mommy makes it tippy. Daddy drive.” Thanks for the confidence boost, bud. 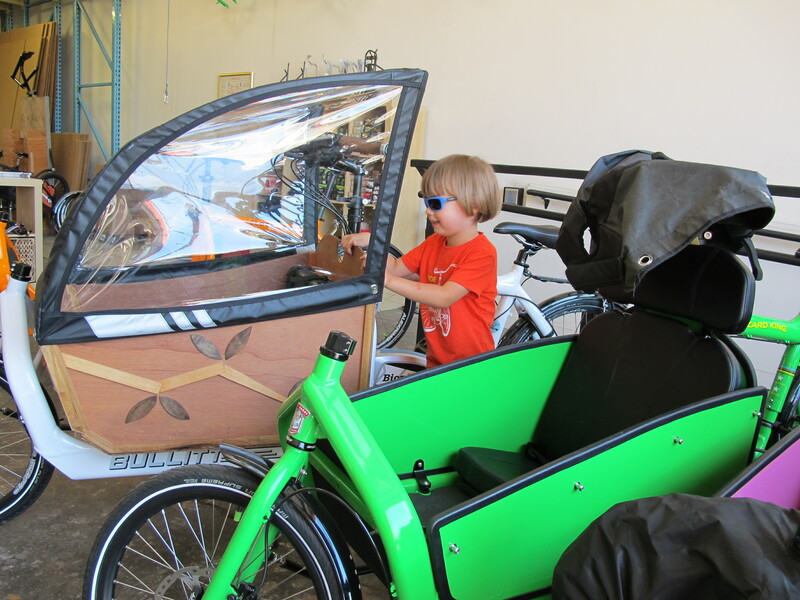 We explained that I really wanted to try riding the new bike some more, and we offered to let him ride in the trailer instead of the Bullitt’s box. Even after our tip, he was a huge fan of his spot up front in the box (he’d been complaining that the trailer was bumpy, which it is), and he opted to stick with mommy. At this point, he decided that if he was stuck with me as the driver, he may as well think good thoughts, because he said, “You can do it, Mommy,” and then proceeded to chant, “Go, Mommy, go,” for ten blocks of uphill riding. We made it with no more than a few wobbles, but by the time we reached our second stop, I was ready to be done with the Bullitt. I could ride it, but it wasn’t particularly fun, so Matthew and I swapped back. Of course, we neglected to get any photos of me actually riding the dang thing, so we had to stage this the next morning. Note that the kickstand (you can see one of the legs bottom center) is down. Also, I’m sitting crazy high because it wasn’t worth adjusting the seat height for a photo op. I’m glad we tried the Bullitt, but after twenty-four hours, I was happy to return it. Neither Matthew nor I ever really got comfortable to the point that we could use arm signals, which is an important part of riding in traffic. We agreed that both the trailer and the longtail are much more nimble and easier when climbing. 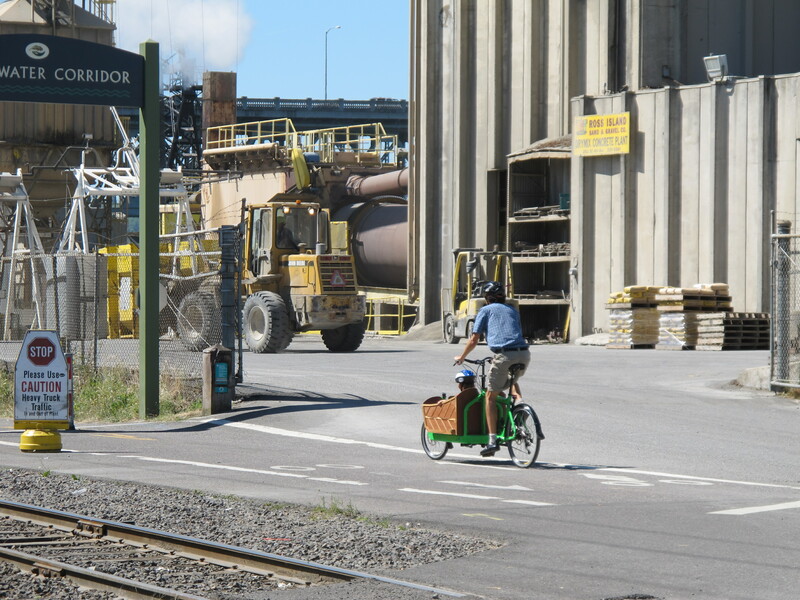 The Bullitt (or similar bakfiets-type bikes) seems like a great option for really flat places. Anywhere with hills, I would only want it with an electric-assist (which we didn’t try). On the other hand, if you live somewhere flat or want to go for the e-assist, I can see the appeal. I think with more practice, I would have adjusted to the steering. 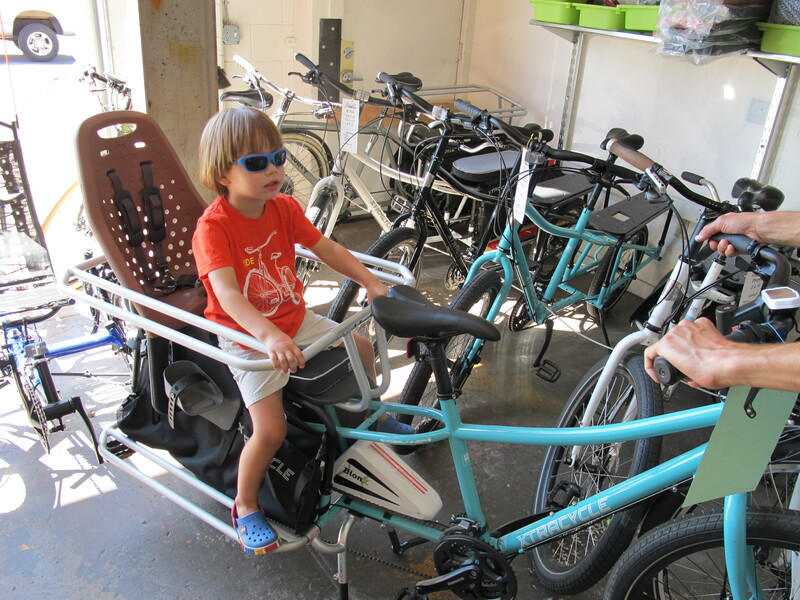 Gabriel really liked being up front, and the cargo capacity is impressive (you could carry even more by adding a rear rack). Compared with wrangling things into the longtail’s bags (or onto its rack), the ease of just tossing things into the box is quite attractive. When we returned the Bullitt, Joel at Splendid Cycles said they had sold FOUR Bullitts the previous day (all with e-assist), one locally and three shipping to all parts of the country (Colorado, North Carolina, and, not too far from home, Springfield, MO). All in all, I’m glad we had a chance to try the Bullitt, but I’m looking forward to returning home to our longtail. There’s no place like home, and there’s no bike like your own! *Big Shark very briefly had a Kona Ute and MinUte, and I did just see a cycle truck at The Hub a couple of weeks ago, but options are VERY limited. 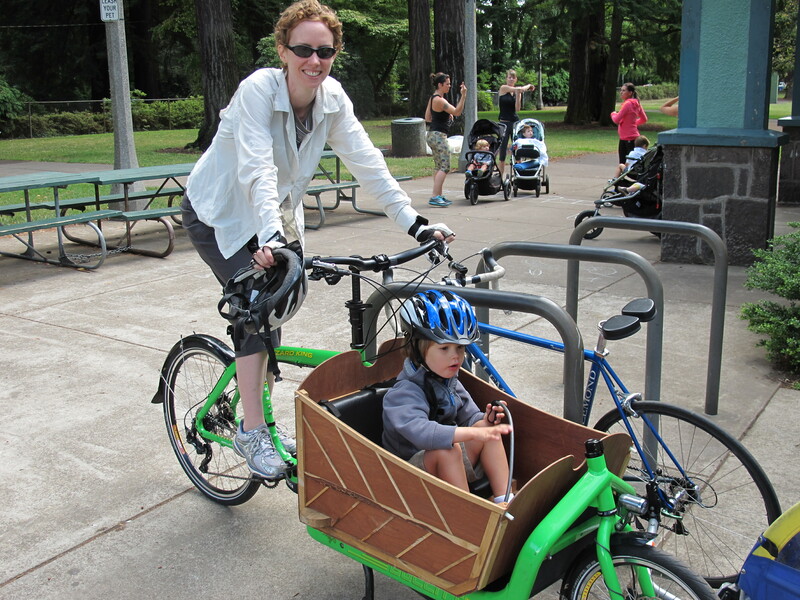 This entry was posted in Biking and tagged biking with kids, cargo bike. Bookmark the permalink. That is good to know. We’ve talked box bikes before and discussed weight and hills, but this sounds really kind of had to use…even on flat. Also, I had a dream you and Monica and I opened a women-friendly bike shop. We could totally make a women-and-family friendly one. It can have a coffee corner and small playground so there is a place to share bike tips and distract kiddos so people can take test rides. That’s a great dream, Rebecca. Maybe we can make it happen one day! Good conversations and points. These thoughts have been percolating since Biking in a Heels opened her shop in Boston. I LOVE your dream, Rebecca! Something like you described needs to happen. I know that when I was shopping for a bike, I felt the area was missing women’s needs customer service. I have also heard from other female bicyclist friends that they felt “intimidated and made to feel stupid” when going into some bike shops. Not everyone (woman) is a road cyclist that reads cycling racing magazines cover to cover and can tell you the difference between Shimano brakes. I think there is a big gap in biking world that specializes in women commuters/family cargo riders. Most bike shops you see race and speed mentality. However, I think there is a huge population out there of women (and men included) that would love to rely less on their cars, be able to take their children along and get some exercise in along the way. This group doesn’t want to invest in special clothing and shoes, they just want to get on the bike and go and know they got the right bike for their needs. I know when speaking with Rebecca, she and I knew of different features and components of different bikes and accessories. We knew what worked and what didn’t work. I LOVE reading your blogs on the different cargo bikes you tested because I would LOVE to have tested them myself. I love it because it comes from a mom/woman point of view. You speak of the limitation you experienced as well as the benefit you got. Hhhmmmmm maybe we touched on something here, bike sisters. Monica, the bike industry, like many sports, has indeed been traditionally male-dominated. As the role of bicycles shifts in the US to include more transportation and not just recreational aspects, so too shifts the mix of men to women. But, that change is slow. In cities like Portland most of the good shops employ women but it hasn’t always been that way. When I started working in shops in the late ’80s, I knew of most of the women that worked in shops in the US, now there are so many in Portland that I don’t and can’t begin to know them all. I believe that shift came as cycling gained popularity as transportation. Ha! “Mommy makes it tippy.” Totally cracked me up. Well, at least he converted from critic to supporter. I don’t think I’ve ever seen one of those before, but since they just shipped one here, perhaps I’ll start running into them. The steering issue would make me really uneasy though. Have you ever tried one of those adult tricycles with the big cargo box in back? Actually I just did a Google search and I see that they have them with the bin in front too… and two wheels in front – sorta like a backwards tricycle. Anyhow, seems that would be the way to go for cargo stability. But any way you slice it the hills would be a pretty big issue here if you were carrying any meaningful amount of weight. Cargo trikes can be more stable…or more unstable. Believe it or not cargo trikes also have a bit of a learning curve. For me, just as challenging as adapting to the Bullitt. What makes them challenging is how having three wheels on the ground affects the ride. They are great on flat surfaces and at low speeds. However, not too many streets (at least here in Portland)are without uneven pavement or bumps of some kind. Those bumps have the 3 wheels shifting the bike around a bit – feels a bit like a bucking horse. You get used to it eventually and know how to steer or not as you ride along but it is quite unnerving at first. And, if you gain speed (> 10mph) then cornering can become a challenge. Why? Well, when you ride with two wheels you lean as you corner. When you ride with 3 wheels you don’t lean and if you do you may find one wheel off of the ground. So, you have to learn to corner differently, and more slowly or again the bike feels a bit awkward. So, sometimes more stable – slow and flat; sometimes less stable – fast or hilly. Hmmm… very interesting. Thanks for sharing your experience. I live on the west side of Denver and there are a lot of very steep hills in my area – the kind that are a challenge to get up even on a 17 pound carbon fiber road bike! Hence, my cargo-hauling trips are generally limited to stuff right in my immediate neighborhood, on my trusty 30 year old Trek hybrid with rear baskets. If I ever did decide to invest in a cargo bike it would be for the sake of hauling stuff from farther afield (like in the 3-10 mile range) – but doing so would involve some serious hill climbing (we’re talking 15% grade hills – the kind where there are sand barrels on the sides of the roads to help cars get up them in the winter time). Sooo… I guess that means that I’d be looking for a battery assisted system of some sort if I ever decide to take the leap! Hi Barb from Splendid here: thanks for visiting us. I know the Bullitt is not for everyone for a variety of reasons. It certainly has a longer learning curve than trailers and long tails but believe it or not, once you get comfortable on the bike – for me that took about a week of riding – it is a very stable bike. The steering on these bikes is just so different from a conventional bike that your brain needs time to adapt and understand. Once the brain adapts though, I think the Bullitt is a blast to ride. I know, that’s hard to relate to after a wobbly ride, but eventually that happens. For me, it’s now the go-to bike when I have to travel in less than ideal conditions: rough roads, slick roads, or steep hills. While it does take a little more effort when climbing, there’s no bike I’ve ever ridden (and I’ve ridden lots of bikes) that was more sure-footed on descents or unpredictable terrain. For those considering a box bike know that many dealers – including us – offer extended test rides so that you can work through the learning curve a bit and then really determine if the bike is right for you. Anyway, although the Bullitt wasn’t your favorite, I do hope Portland was good to you and that you enjoyed our fair city and all it has to offer. By the way, you saw it right – from the seat of a bicycle! We have really been enjoying our time in Portland, and I’m so glad we’ve been able to experience so much of it by bike. Gabriel is clearly impressed with the number of bicyclists, announcing at one point, “This is a really big bicycle day!” To which we replied, “Well, that’s just every day here in Portland.” Cheers! Oh I love Gabriel’s announcement! I might even have to steel it now and then. Even though I live in Portland, I remember a time when not every day was a “really big bicycle day,” and so I am constantly amazed at the big bike days we have everyday. I find it truly inspiring. And, no worries about your honest depiction of the Bullitt. I think expressing how you felt is important. It opens the conversation for dialogue and that has much more value to me than a glowing review. It’s important to me that discussions of experience occur around cargo bikes. For most families that are considering one, it is a huge investment both in money and time so making sure they are considering all of the aspects of a bike is important. Raising concerns helps many people start the conversation around choosing the right bike for them. And, since it’s just the start of the conversation, I wanted to chime in with another perspective, to keep the conversation going. Thanks for sharing your honest and open thoughts and for letting me share mine – it is all good and all for encouraging more families to consider cargo bikes. I have only seen bike trailers, but Portland is the Rome of cycle cities. St Louis is Paris, I guess.